This digital artwork provides a conceptual illustration of winter's mark on the world with impressions on a sidewalk near my house of the outlines of now-gone rain-soaked leaves imprinted into the concrete. Nature's print! 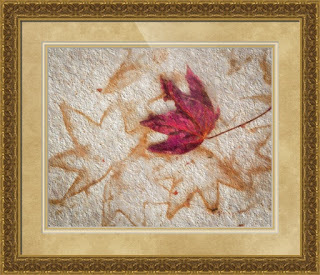 One remaining fallen red leaf provides a "trompe l'oeil" 3-dimesional effect. Prints available from as low as $18.98 Price varies by media type, framing, and size.